I just tried the steps in this article (having read the 2 blog posts before this one only to find out I couldn't go that route since I want to host in IIS). Anyway - am happy to say that my initial efforts in following the steps in this post worked great. Looks like it will do the trick for me. Thanks! One thing to help other users. It was briefly stated, but something I overlooked... Turn off Basic Auth in IIS and remove tag from your webHttpBinding! Thanks for the post. When trying to implement method level security, no username is given in securityCtx.PrimaryIdentity.Name. Is there another way? Well, I dumped a lot of time in this, and like you I discovered that there's no IIS7 support for the approach you outline in previous articles. I can't be too mad at you -- because overall you did save me with this article and you appear to be someone who can write well about technical matters. Thank you, sir. I have implemented above functionality but while validating user credentials at CoreAccess function i am getting "WebOperationContext.Current" as null. I dont know why this happens ?? You have any idea about this? what an awesome post man, great job, and great job with the rest of the posts. 1. when throwing WebFaultException(HttpStatusCode.Unauthorized) it actually returns 500 instead of 401. 2. returning 'false' shows status code 500 in fiddler instead of 403. 3. returning 'true' shows 200 and passes client to the requested resource. Over http it works fine but when I try over https I get a 404 error. Any clue? Thank you very much for this post. Have being searching for over a year. Didn't found this one on my first research. The 404 might be an indicator that you do not have the HTTPS binding set up or configured in IIS correctly and therefore it cannot be found. Have a look at something like http://www.codeproject.com/Tips/722979/Setting-up-IIS-with-HTTPS-Binding to ensure you have your HTTPS endpoint set up correctly. Thank you for your fast asnwer. The certificate was ok. As I said on last one, is was just the transport security activation. It is just great, really great. I'm really grateful for your post. I've tested this on a basic connection (soap) too. Can even test on SoapUI using the "authenticate pre-emptively". Only negative point so far is that I cannot use the mex endpoint, because it is also hidden behind the authentication. Tried to use different service behaviors for the mex endpoints but I didn't succeed yet. You are probably sick of me by now but that's me. When I find something interesting I'm like a 5 year old boy. Trying this with .NET 4.0 and both running locally in Visual Studio and also trying while hosted in IIS 7.5. In both cases if the credentials specified in code are not a match, it throws a 401 error as expected but I never receive a prompt for credentials as you say will occur. Your screenshot shows a prompt for credentials, but I am not seeing this on my end. Please advise how you are getting this to occur. Still the best article on this area! I don't know why no one has mentioned, if i don't put this tag i don't get the alert asking for user name and password. I still cannot make my code to call ServiceAuthorizationManager though. The alert pops up asking for the user name and password but nothing happens when i supply it. One thing i learned is that do not trust MSDN documentation. No clarity, no details. only for reading for time pass. Thank you thousand times for this blog entry. 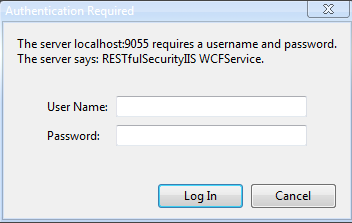 This was the solution for converting a working selfhosted WCF REST API with basic authentication to work in IIS. And your solution is usable with SOAP services accessed through standard ClientBase derivative.